I’ve enjoyed director David O. Russell’s other movies (Three Kings, American Hustle, Silver Linings Playbook, Joy) quite a bit, so I was pretty excited about watching this movie. I was not disappointed. 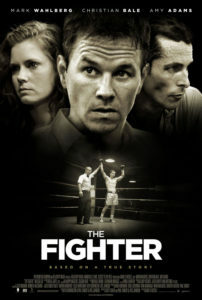 The Fighter is biographical sports movie about boxer Micky Ward (Mark Wahlberg). Micky is managed by his mother Alice (Melissa Leo) and trained by his half-brother, former professional boxer Dicky Eklund (Christian Bale). As he keeps ending losing the fights they secure for him, he realizes that he needs to choose between his career and his family, as painful as that may be. As usual, Christian Bale steals every scene he’s in as the crack addicted Eklund who spends his days making trouble and talking up his former glory. This is really Mark Wahlberg’s movie though, and he’s great at playing the sympathetic underdog. I also liked that the movie ended on a high note without losing any complexity – often movies that deal with family conflict end up being too saccharine and neat, but this wasn’t one of those. Winter’s Bone stars Jennifer Lawrence (in her breakout role) as Ree, a tough teenager from a poverty-stricken family who needs to find her missing father in order to avoid her family being evicted from their home. It makes total sense why she was cast as Katniss in the Hunger Games movies after this performance, her character in this movie is very similar (dealing with poverty, taking care of her family because her mother has checked out mentally, willing to do whatever it takes to keep her family safe). It does pack a lot more punch because this seems like a real story set in our world, and it’s scary to be exposed to a world of such uncertainty and loss. This isn’t always a pleasant movie to watch, but it’s well worth it. This movie tells the story of Ron Woodroof, an electrician who contracted AIDS, and his business (the titular Dallas Buyers Club) which helped make medication that hadn’t gone through the long FDA approval process available to dying patients. Matthew McConaughey (who plays Woodroof) and Jared Leto (who plays trans woman and fellow AIDS patient Rayon) absolutely steal every scene that they are in. The movie reminded me a little bit of Erin Brockovich in its style and tone, although the content is very different. I also appreciated that the movie wasn’t on a crusade for one side or another, it did not portray what Ron was doing as noble or purely altruistic. Ron is definitely the protagonist and he believes in what he’s doing, but it also shows the other side, such as Ron having medical issues because of untested new drugs. Based on a true story, 127 Hours is about canyoneer Aron Ralston who was trapped by a falling boulder for over 5 days and ended up cutting off half his arm to escape. It’s a pretty intense and sometimes unpleasant movie, but it’s very good. James Franco plays Aron Ralston and he gives one of the best performances of his career. Director Danny Boyle has the tough job of making a movie about a guy who doesn’t move for over five days interesting, and he rises to the challenge with aplomb. He uses memories and hallucinations (which the real Ralston describes as highly accurate) to keep things paced well, and he utilizes interesting techniques like split screens to keep your attention focused. This movie might make you queasy if you’re squeamish, but it’s definitely worth a watch. I’d heard great things about Josh Trank’s debut, Chronicle, for a very long time but we only just got around to watching it. It’s a found footage movie about three high school boys that find a mysterious object in an underground cave and end up getting superpowers. It ends up being a somewhat typical superhero movie, but the perspective it’s told from makes it unique. I was hoping it would end up being more of a coming of age story that happened to involve superpowers, I think that would have made it even better. That’s not the route it took, but it’s still a terrific and original film. This movie is based on the true story of Florence Foster Jenkins, a New York socialite who was a terrible but beloved singe who gave many performances, including one at Carnegie Hall. Meryl Streep plays the main character with pathos (and picked up her 20th Oscar nomination for it). Her Florence is sad and somewhat delusional, but she’s also passionate and generous and you can see why so many people are willing to lie to her just to see her happy. Hugh Grant is also terrific in his role as Florence’s husband – they have a complicated relationship and he makes it look easy. The end of the movie was a little too dramatic for my taste and seemed to undermine the characters it had built up, but overall I enjoyed the movie. I was sure I’d like this movie since Michael Mann (Heat, Collateral) directed it, but I found myself underwhelmed. Johnny Depp plays famed bank robber John Dillinger and Christian Bale plays Melvin Purvis, the FBI agent tasked with tracking him down. The acting was good, and the movie was clearly made with attention to detail, but I couldn’t get invested in either of the main characters and I didn’t care what happened to them. The ending seemed to want me to feel a lot of emotions that the rest of the movie failed at setting up. The most compelling character was Dillinger’s girlfriend Billie, played by Marion Cotillard but the movie is not really about her. This entry was posted in Movies, Reviews by Kriti Godey. Bookmark the permalink.